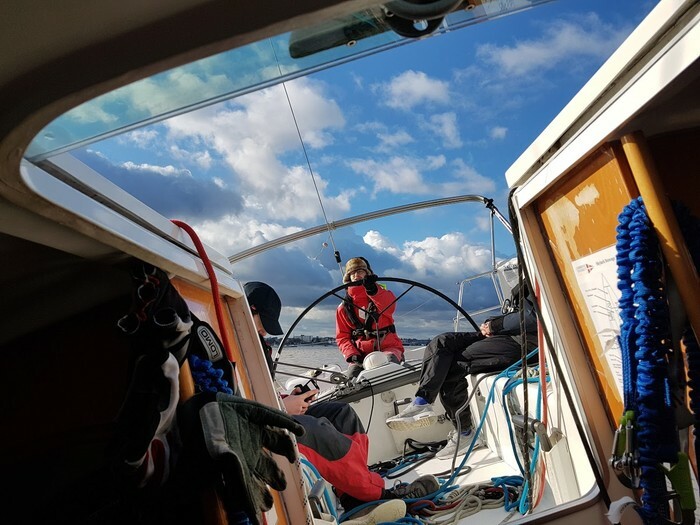 Our trip already began with uncertainty; up until the day before, we didn’t even know if it would even happen: unfortunately, on the preceding weekend’s trip, Skylark’s propeller had finally reached the end of its life, and our yacht had gotten stuck in Shotley. Fortunately, the new propeller got delivered and fitted on Thursday, and Skylark was put back in the water on Friday morning. Just in time for our evening departure! So on Friday evening we drove to Shotley (it took almost as long to get onto the A14 as it took to get to Ipswich… I keep forgetting how bad Cambridge traffic is). Once we got to the marina, we moved Skylark to the fuel pontoon to fill up. Arturo (first mate and head chef) was going to prepare dinner … but the gas was gone! Fortunately, there was one last full gas bottle in a different locker - just the regulator was a bit stiff. Thankfully, the 24/7 marina staff lent us a wrench (and Skylark did have a toolbox with all the tools on board as well, my first mate just didn’t think of looking in the obvious place, and I didn’t think of them not looking in the obvious place…;)). 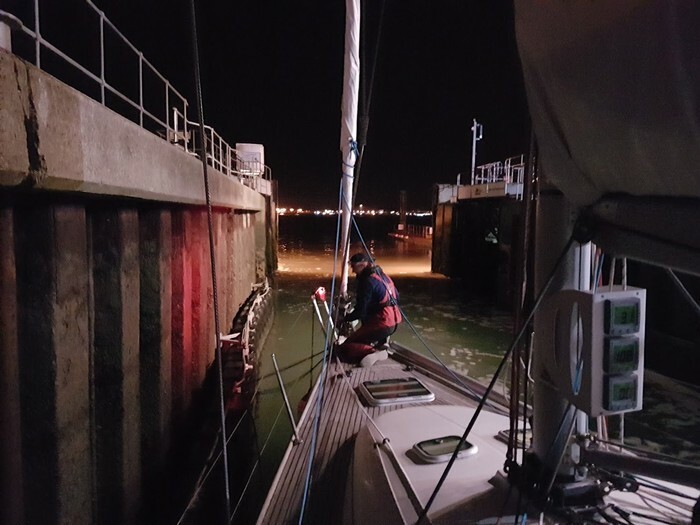 Fuel and gas topped up, once the final crew arrived, we went through the safety brief & then through the lock, headed out towards the sea and had a lovely leek & (veggie) sausage risotto for dinner - to prepare our stomachs for sailing through the night. Once past Landguard, we quickly hoisted our sails, and started the night watches. First watch, 10pm-1am: Dry weather, fast and exciting sailing, heading across the Wallet Spitway, more fast sailing… then sleep. Second watch, 1am-4am: Waking up after just three hours of sleep, then having to beat into the wind that was heading us, accompanied by lovely rain all watch long. Dark and nothing to see, the night at its coldest. They definitely picked the short straw in all regards:( and didn’t even complain! Third watch, 4am-7am: Six hours of uninterrupted sleep, the drizzle had stopped, we didn’t have to beat anymore, and got an hour of nice sailing before the wind died down. (We had planned to shake out the reef, but then it became clear that the boat needed a bit of cleaning, and by the time we were done with that, the wind was gone altogether.) Dawn approached and Southend pier came into view. Just around 7am, we arrived at Southend. With the tide now firmly against us, we decided to moor up and catch a bit more sleep before the tide would again. Following the almanac, which suggested that it ought to be possible to moor up at the pier itself, we motored close - but couldn’t spot anywhere that seemed like a reasonable place to attach a yacht to: only vertical piles everywhere. (Maybe somewhere on the inside, where we hadn’t gone?) Instead, we anchored on top of the sandbank just south of the pier, and here, in the middle of nowhere, right next to a busy shipping lane, it seemed like a very sensible idea to hoist the anchor ball. For those who followed Skylark’s track on AIS, it certainly seemed rather peculiar: a boat in the middle of open water, not moving at all? Had they gone aground?? But no, there was plenty of water underneath. Once everyone had caught some more sleep, and the tide was about to turn towards central London, we got going again, and everyone had breakfast. Slowly the wind was starting to pick up again, and once on the Thames proper, we went back to being a proper sailing boat again. 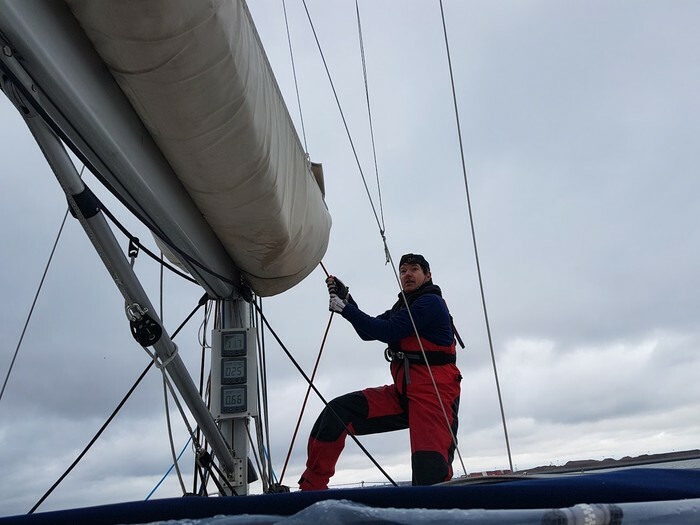 That we had to tack up the river didn’t stop us, and with the tide underneath our keel we easily made 8 knots over ground. The Thames is certainly a bleak and gloomy river for the most part - oil and cargo terminals, industrial sites, debris and barren land either side, foul smells… One notable exception was the Sikh temple and some of the other buildings in Gravesend. Afterwards, back to more desolateness. There wasn’t much traffic on the river, only a few cargo ships overtook us. One right as we were tacking upstream underneath Queen Elizabeth II Bridge… great timing! But we were fast enough at tacking back and forth that it didn’t pose a problem. Eventually, we got to the Thames Barrier, and hence had to drop the sails and motor the last couple miles. This is where the scenery finally became more exciting: not least the Barrier itself, and as it turned to dusk, the lights came up everywhere … passing underneath the Emirates cable car, the Millenium Dome, a golf range behind huge fences to keep the balls in, the Isle of Dogs, Greenwich with the Royal Naval College and the Cutty Sark… at the same time, the river was now busier and rather less calm, with countless Clipper catamarans steaming past, and even a bunch of RIB speedboats (probably the tourist and not MI5 kind though). After dinner, we walked to Dickens Inn around the corner, where we met a couple old hands from CUYC. However, everyone was a bit tired and looking forward to some proper sleep before getting up on Sunday again, so around 11pm we were back on board. Fortunately, by now the Clippers had stopped and our night was peaceful enough. And just as we were turning around to head back home, the engine cut out! And at this point the tide was slowly but surely going upstream towards the bridge. Which wasn’t open and hence wouldn’t be high enough for us to pass through… Panic, call the coast guard!!! What to do now??? 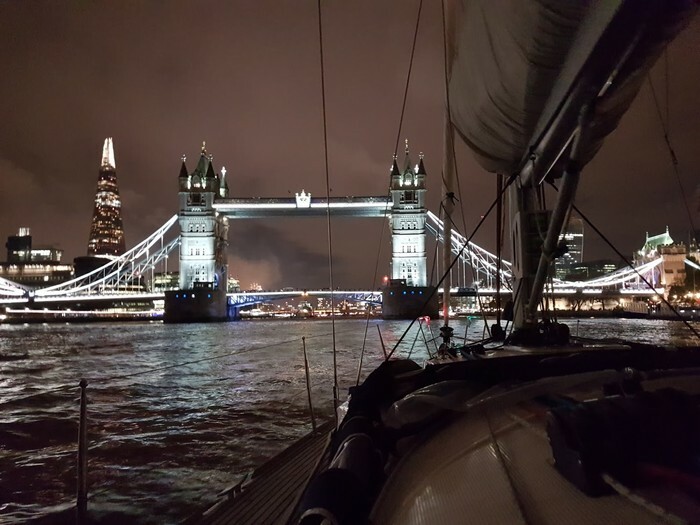 After briefly considering deploying the anchor to stop us from smashing into the bridge (but probably fouling the anchor on the ground of the Thames…) I realised that putting a sail up might be a much more sensible thing to do. And fortunately, the wind, a very light westerly, was just enough to gently move us away from the bridge. Immediate danger averted, we quickly realised that one of the mooring lines had fallen off the foredeck and wrapped itself tightly around the propeller. (Lesson learned: do not become complacent about lines; always double check and get the foredeck crew to take all lines back to the cockpit right away, even if they are competent crew and you trust them a lot…!) The question was, what to do next? We still had to get all the way back to Ipswich … A police boat showed up and asked us if we were okay, and then let us sail down the river under the jib… London VTS was okay with us sailing through the Thames Barrier, but once we got to the next bend, it became clear that the wind was too light and too flaky to get down the whole river under sails in one tide. 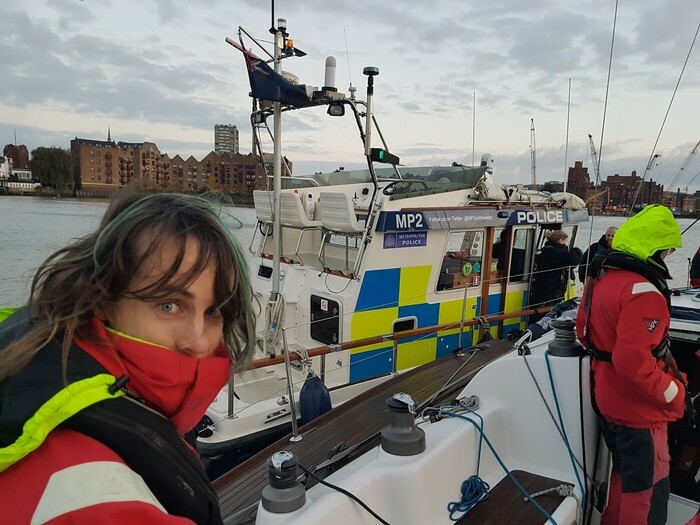 We were just next to the Metropolitan Police pier, and so we asked over VHF if we could sail onto the pontoon to figure out our next steps… the police weren’t happy with that, but their boat “John Harriott IV” came back to us and offered to tow us to the waiting pontoon at Limehouse Basin. At this point it was around 7am, they hadn’t even had breakfast yet! We tried offering them a lot of different things, but only the cookies seemed to work. They were very grateful for those though! “A cookie keeps a police officer happy.” :) The Marina wasn’t open yet, and we were trying to find a diver of sorts who would be able to get the rope off. But who’d even be able to see the propeller in the murky waters of the Thames?? Fortunately, the police officers had mentioned that the manager of South Dock Marina was a very helpful fellow, and the almanac even had an emergency number ready. So we rang him out of his sleep (just a few minutes before his alarm though), and the police boat, after a bit of deliberation (they had a bunch of other jobs to do afterwards), kindly agreed to tow us even further, and eventually they dropped us off right next to the entrance to the lock into South Dock Marina… no waiting pontoon here! Just the bare stone wall. From here, we had to warp Skylark into the lock, through the lock, and out again, all the while ensuring that the boat wouldn’t smash into the stone walls and all the stuff poking out of them. Patrick Keating, the harbour master, and his colleagues were super friendly and helpful and made sure we got everything right, and didn’t even seem to mind that we were giving them work this early on a Sunday morning! Eventually, we were underneath their crane, and once we had managed to take off the back stay, they lifted the boat. From a little work boat, one of the marina staff and Jack managed to reach the propeller, and fortunately could take off the rope without even cutting it, and the propeller seemed entirely undamaged (good thing, given that it was just two days old)! With the engine being able to go back in service, we quickly went back to the lock, and thankfully managed to get out during the short window around high water in which there was enough water between lock and river. If the staff at South Dock Marina hadn’t been so helpful and fast, we would have easily been stuck in London another ten hours until the next high water! Finally - with just about two and a half hours delay! 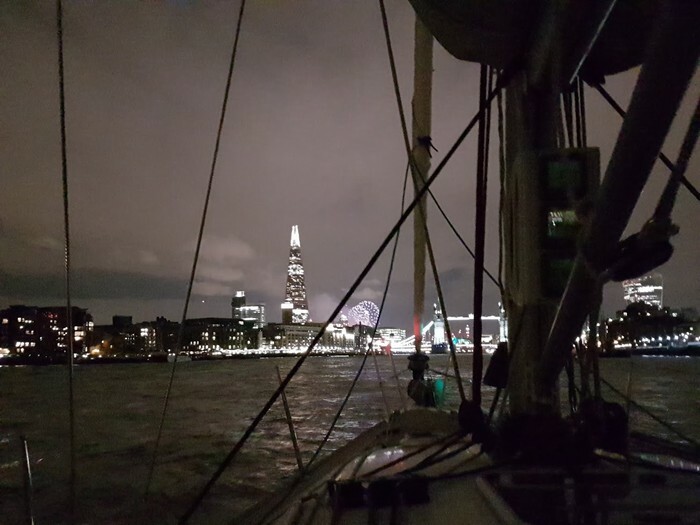 - we were back on track, once more going past Greenwich, the Millenium Dome and the cable car, and through the Thames Barrier… and, again, the wind started picking up, so back to sailing it was! And very quickly we put in a reef, and another, and another… heavily reefed, we breezed downwind, downstream, and this time we had to gybe back and forth to be able to follow the river’s course. Around midday on Sunday we were back at Southend. From here the waves started building up, and still on a reach we even managed to surf several times, with the log repeatedly exceeding ten knots. Exciting sailing indeed! It was around 9pm when we dropped off our drivers at the Shotley waiting pontoon, so they could get the cars back to Ipswich. Reduced to four of us, we motored back towards the Orwell. With the wind coming straight down the river valley, we had to stick to the engine, which didn’t seem to make much progress against now both wind and tide, with a speed over ground of just 3 knots. Made for a looong slog up the river… First we tried to stick to the side of the river in shallow water to have less tide against, but it turned out there were too many mooring buoys and not enough light to spot them easily enough, and we didn’t want to get one of them wrapped around our prop! So in the dredged channel we stayed. Until we heard a loud honking, which turned out to be a river freighter coming up behind us. It ended up passing just a few meters next to us - we jumped when we noticed! Having complained to Hywel about the low boat speed, it turned out we had gotten the engine revs wrong… thought 2500rpm was for cruising, but apparently this changed with the new alternator (number three or four this year…). Turns out we could actually do 2800! That improved our speed a fair bit. If only we had realised earlier! Finally we got to Ipswich, getting close to midnight now, and the only hurdle remaining was getting through the lock. Didn’t expect this to be any issue - we called them on VHF - only to be told that they were dealing with commercial traffic and that we should wait until they would get back to us. So we waited… We intended to go on the waiting pontoon, the foredeck crew cancelled that plan last minute (with some confusion by the helmsman), because the heaps of guano didn’t make stepping off the boat and onto the pontoon appealing or safe - who wants to slip in that and end up in cold November water?? So we just kept circling around, at one point got a call by a commercial vessel that was about to leave its quay, was going to turn into us and in the most polite words conveyed a very clear “get off”. We all had a quick final dinner (once more thanks to Arturo), and then we headed off back towards Cambridge. By the time we were in our own homes it must have been 3am, we were all dead tired, exhausted, and happy to have had such an amazing adventure from start to finish. 200 nautical miles in two days! 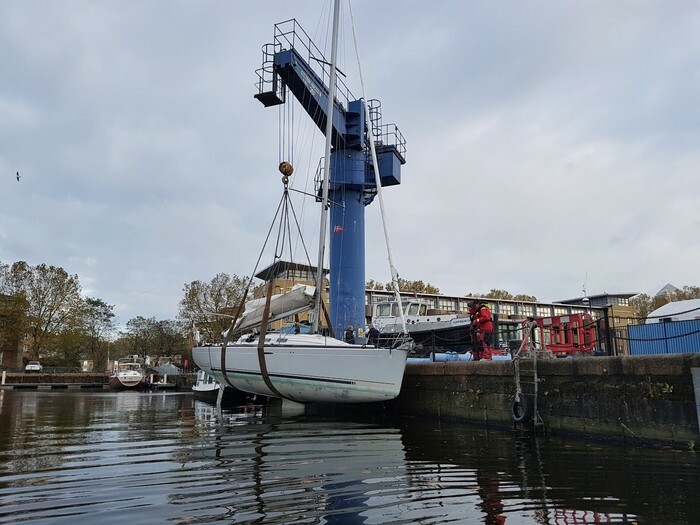 Many thanks again to the kind crew of the “John Harriott IV” Met police launch and Patrick Keating and his colleagues from South Dock Marina, who had a big hand in the happy end of this adventure! You can see these (and a couple more) photos in full size in the photo gallery.